Summer Sale, take 10 -15 % off your block or table, call us for details, phone; 630 - 739 - 5200 ! After purchase, please email us your color choice. Call us for other color choices and fabric styles. Free Shipping is available in most areas of the continental USA only. 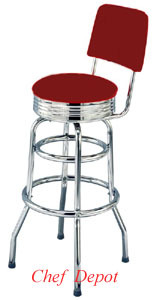 Our "1971-240" Retro Swivel Bar Stools are made in the USA! Phone us @ 630 739 5200 More pictures are here! Free Shipping to most areas in Cont. USA Only! Applies to all chairs! 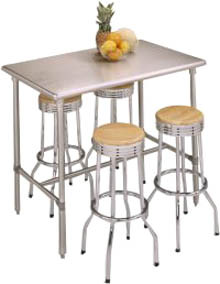 Our new Aluminum Bar Stools are fully welded and made to last! Highest quality you can buy, it is rated for indoor or outdoor use. Equally ideal for any patio, lounge, restaurant or home. Features a classic 3 ladder back with arms in lightweight lacquer sealed aluminum. Features super-sturdy fully welded aluminum frame, ideal for commercial or residential use. Available in 30" seat height. Fully Assembled Made in the USA. Measures 21" x 20" x 41" tall. Other heights in this stool are available by quote, call us. Chefs Note: The quality of these chairs is unsurpassed. If you want the highest quality made, this is it! Free Shipping is available in most areas of the continental USA only. Oversized freight charges may apply. 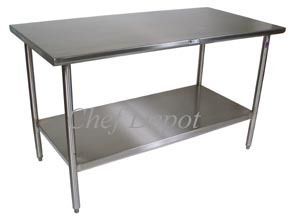 Chefs and Cooks love our Chef Tables! (this bar height table will accomodate 30 in tall stools). we can ship yours in aprox. 4 weeks! Other sizes/styles are available, call us. More SS tables are below! 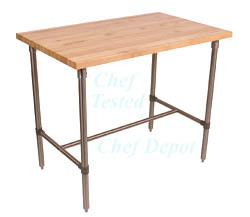 Click Here for even more Stainless Steel Tables! Questions, Please call us! Click Here for electric Knife Sharpeners! Call us with Questions! Click Here for Chefs Selected Knife Sets! Nothing but High Quality! The new Industrial Stainless Steel Buffet Cabinet features 16 Gauge commercial food service grade stainless steel (18/8 grade), it has a reinforced medium polished top and fixed shelf with solid stainless legs. 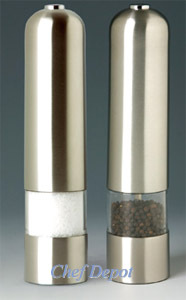 It is engineered for safety and approved for foodservice use. Made by John Boos, this table has adjustable feet for levelling. The This cabinet is available in 3 sizes below. call us, we can answer questions and assist you. Industrial Stainless Steel Buffet Cabinet 72 in. x 15 in. x 35 in. $1399.00 Call for sale. 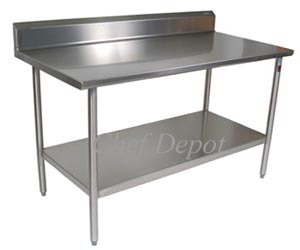 Our new exclusive Designer Desk is made of brushed Stainless Steel, 16 Gauge commercial food service grade stainless steel This modern, clean, open - modular desk is made from pure 304 high grade brushed stainless. Ever watch the TV show TWO and a HALF MEN? We supply the props and many of the set props for other TV shows and movie set production too. These are MADE IN USA, the highest quality you can buy. Can you imagine this desk in your home or office? These are priced upon request. 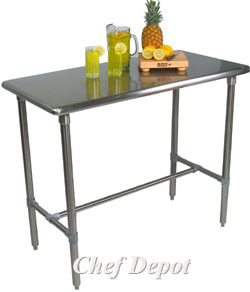 Designer Desk, brushed Stainless Steel 60 in. x 24 in. 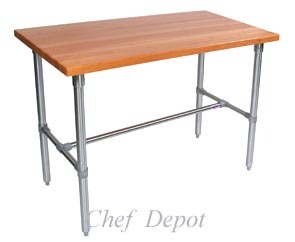 x 30 in., Designer Desk, brushed Stainless Steel 60 in. x 30 in. 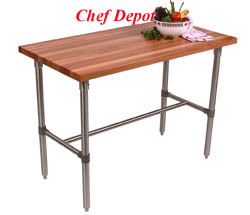 x 30 in., Designer Desk, brushed Stainless Steel 60 in. x 36 in. x 30 in. Email your address and detailed request for a quote, or call us, we can answer questions and assist you. 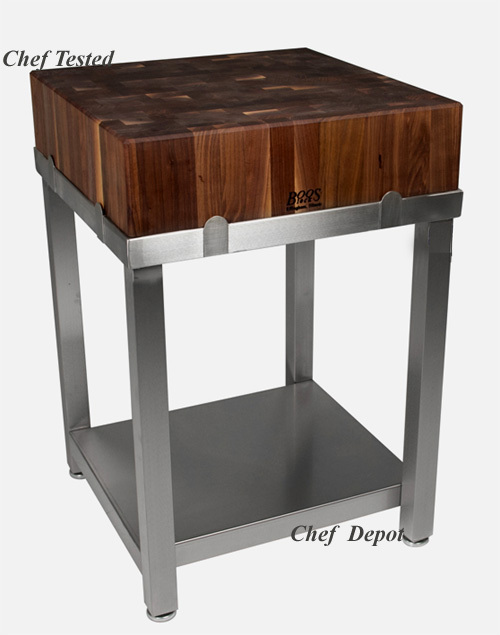 Walnut Laforza Block (block only) $1377.00 Made in USA Sale - Call Us or Email Us! Laforza Base (base only) $639.00 Made in USA Sale - Call Us or Email Us! Free Shipping & Large quantity discounts! More Bar Stools! Large Quantity Discounts are available on Stools! Our Swivel Bar Stools come in many styles and heights, click here. Our stools are made to last, made in the USA! The Minimum order is 4 stools! Made to order in USA, allow a few weeks. many color choices are available, click here! Call us for other color choices, vinyl, leather and fabric styles. Phone: 630-739-5200 Free Shipping is available in most areas of the continental USA only. 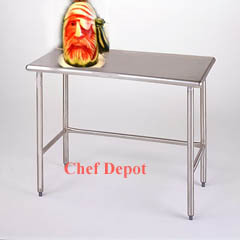 More Kitchen Islands are here. Free Shipping & Call for large quantity pricing! Our new Ladder Back Swivel Stool is made to last! This stool features 1 1/4 in. durable epoxy coated metal frame and 1 in. saddled solid maple wood seat with premium nylon glides and heavy duty sealed roller bearings. The stool and the glides are made to last forever. 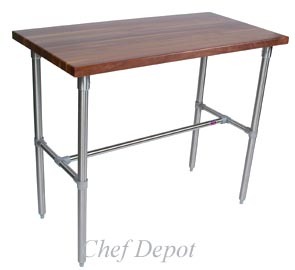 These match most stainless steel and wood top tables. The quality of these stools is unsurpassed. The stool measures: Seat 21.5 in. deep, rear height 43 in., 20 in. wide and 31 in. to stool seat (perfect for 40 in. tall table tops). Shipping weight 46 lbs. each! Made in the USA. The minimum order is 2 stools. Click here ! Chefs Favorite KNIFE SETS! Our Swivel Bar Stools come in many other styles and heights. Our stools are made to last, made in the USA! The Minimum order is 4 stools! Made to order, allow up to 2 weeks. many stool choices are available at low prices, click here! John Boos chrome hardwood swivel stools, made from Select Solid Birch with a natural finish. These work great as dining & bar stools! These stools feature a tough clear coat finish, they match most wood islands, carts and tables. Available in 2 sizes, 24 in. tall and 30 in. tall (allow aprox. 12 in. clearance between stool and table, the 24 in. stools are ideal for 36 in tables, the 30 in. stools are good for 40 in. tables). 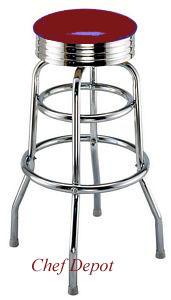 More Bar Stools are available, click here! Free Shipping is available in most areas of the continental USA only. Click Here for the best Chef Knives You Can Buy! Click Here - more Colors Ceramic Knives!